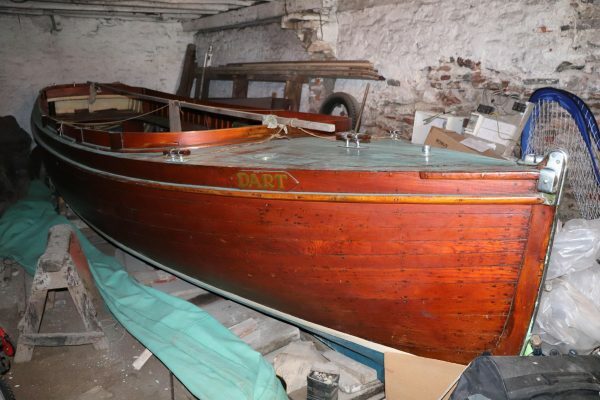 A very special motor launch, this is a true ‘barn find’ and is a very rare and hugely desirable boat. 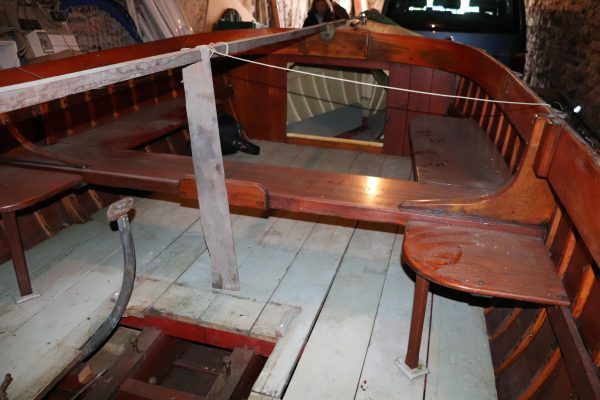 Built on the Thames at Henley, year unknown, she has spent the majority of her life in Dartmouth and served as a passenger launch for many years in the service of a local family who operated passenger and boats on the River Dart. 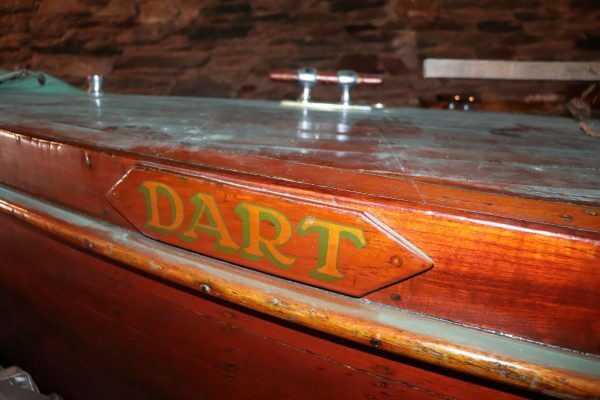 She is named ‘Dart’ and was the first boat to carry passengers to Totnes at the head of the navigable part of the River Dart. Licenced for 12 passengers, the business rapidly outgrew her capability and larger boats were brought in rendering this gorgeous launch surplus to requirements. She was laid up in her current shed more than 40 years ago, nobody can remember quite when it was and she has simply been quietly forgotten. 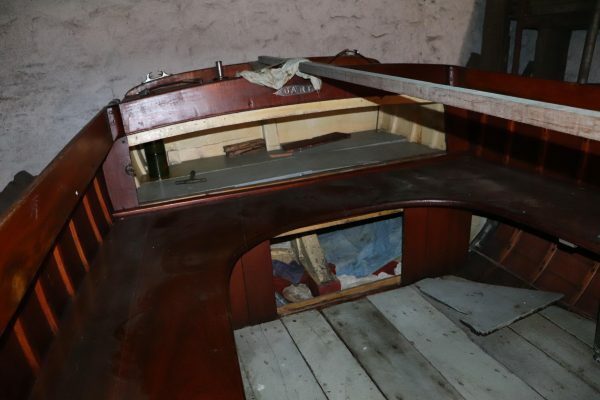 The hull is in remarkable condition, her shed is dark with a damp earth floor which means she has not dried out too much. 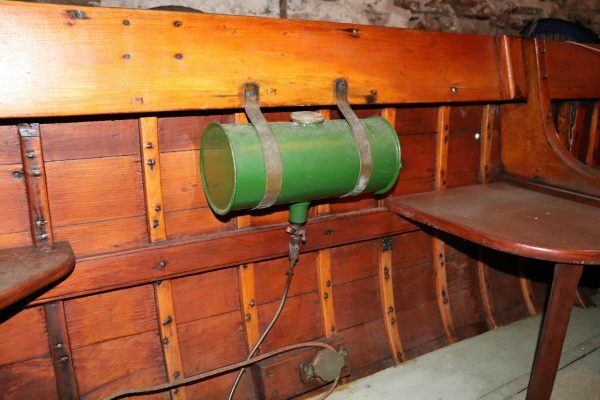 She will evidently need some re-caulking but in general the timber appears to be in good sound condition. 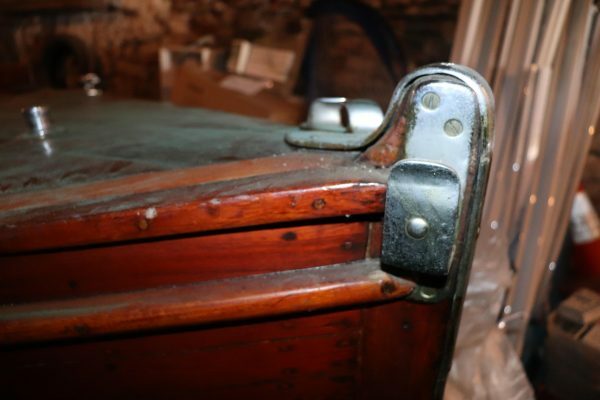 The engine was removed at some stage and is now missing along with the engine box which would probably have been varnished teak. She could be re-engined with either a modern diesel, a contemporary Petrol until or even a steam engine if so desired. 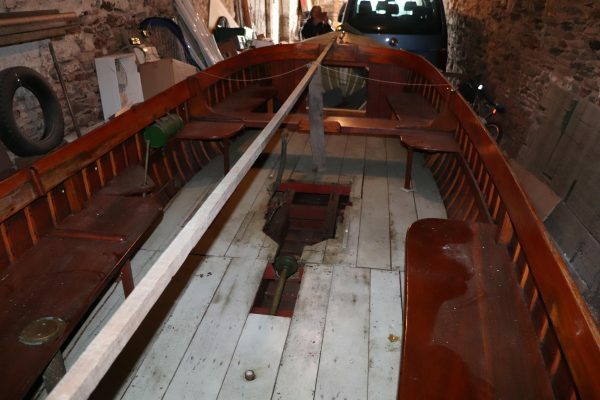 The propeller and shaft are still in the boat as are the large engine beds. 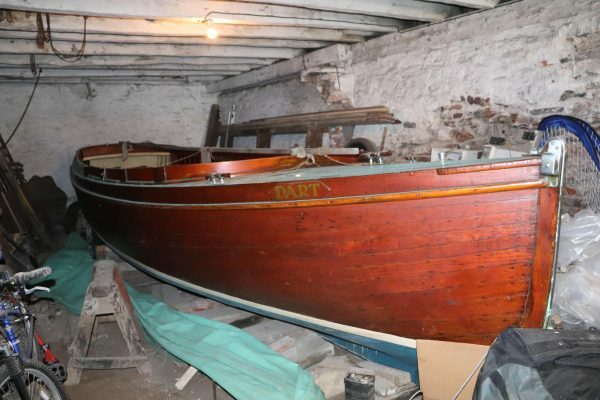 Motor launches of this size and as pretty as this very rarely come up, she will make a very eye catching river boat once refitted and will be a hugely enjoyable and satisfying boat to own. Carvel planked in what we believe is Pitch Pine, copper rivet fastened to closely spaced steamed oak timbers. Caulked and payed seams. 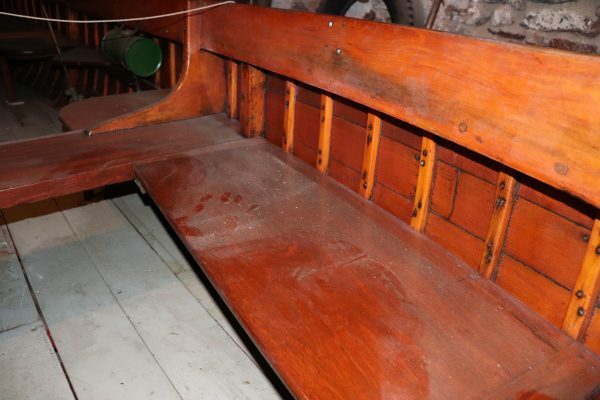 Varnished inside and out, antifoul below the waterline. 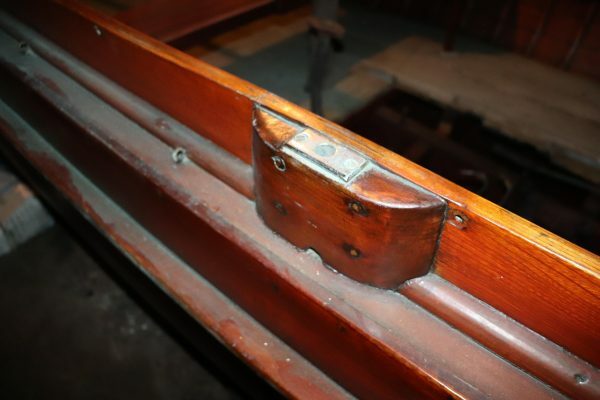 Oak stem and keel with a Pitch Pine transom. Varnished teak thwarts with lots of seating fore and aft. 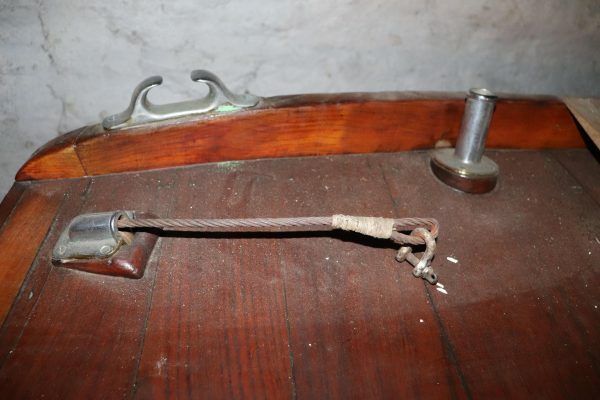 Cable steering to a transom hung rudder. Beautiful bronze rack and pinion steering system to move the cables. 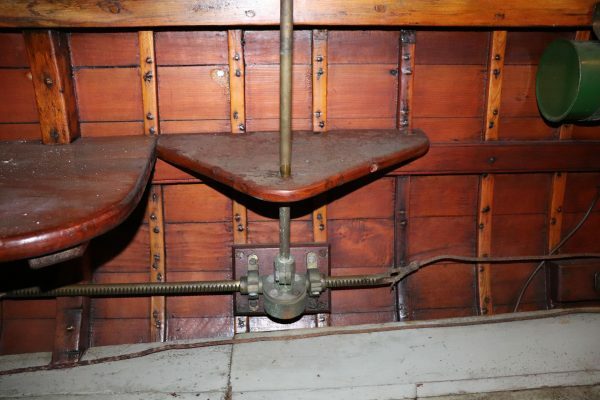 The wheel and rudder are missing. All chromed bronze deck fittings including fairleads, Clyde style cleats, deck fillers and bow roller. Heavy oak engine beds are in place but no engine box. It is understood she once had a twin cylinder Brit petrol engine. 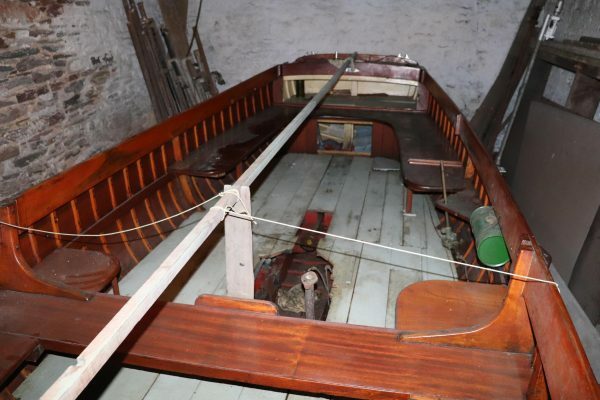 There is currently no engine with the boat, she could take a modern diesel or even a steam engine if desired. Bronze propeller shaft with a fixed 3 blade bronze propeller. 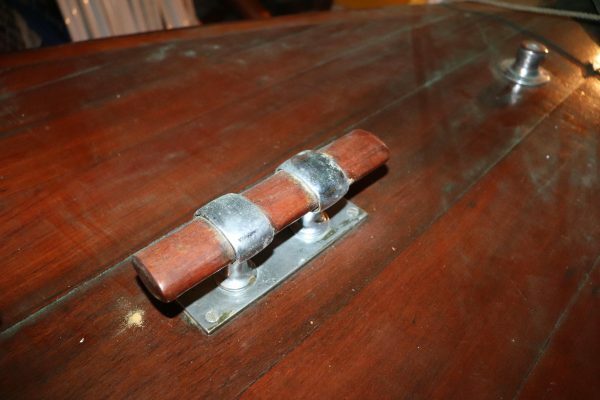 Copper fuel tank under the foredeck.